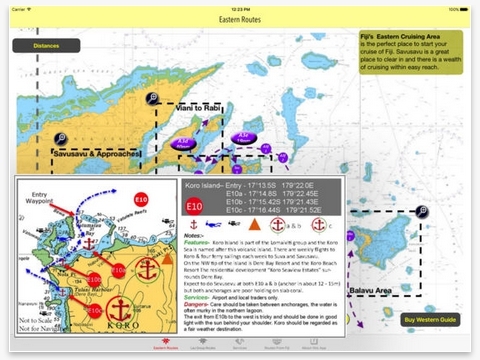 Sail Fiji Planning Guide is a comprehensive planning guide in App format developed for boat owners cruising Fiji. It’s simply a ‘must have’ onboard, particularly for first-time visitors, who will find that the first challenge of cruising Fiji is finding reliable information and charts. 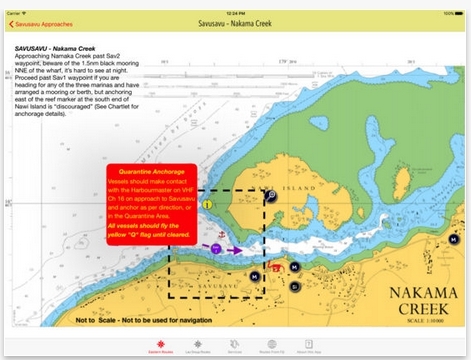 Many cruising areas haven’t been resurveyed since Cook sailed through in the late 1700’s, so accurate navigation information is highly regarded. Developed by Lyn and John Martin and published by Island Cruising Press, the guide comes in two editions. Fiji West covers Central and Western Fiji (ie the Mamanuca’s the Yasawas, Viti Levu and western parts of Vanua Levu) while Fiji East covers the remainder of Vanua Levu and the Lau Group. The problem with traditional cruising guides in book format is that they are often out of date even before they are published. With the plethora of information available online, it’s a real challenge to sort out reliable information from hearsay, or to find specific information relevant to cruising yachts. John says that they didn’t plan to create a Fiji sailing guide, but while writing up briefing notes for various rallies they run through the Island Cruising Association, he realised there was a real need for one written specifically for cruising yachts visiting Fiji (and Tonga, for which there is a separate guide). 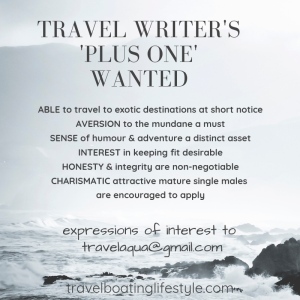 ‘Lyn and I have been cruising the Fiji Islands in our own boat Windflower on a regular basis since 1995 and on an annual basis since taking over the running of the Island Cruising Association in 2007. We’ve taken thousands of photos over the years and logged many tracks and waypoints,’ John said. 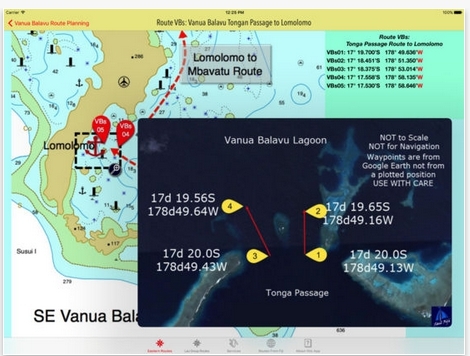 ‘With Sail Fiji we’ve built an information source that’s constantly evolving and available offline.’ All information and charts, except web links, is available without connecting to the internet – an important consideration given unreliable internet connection, particularly in cruising areas like the Lau Group. 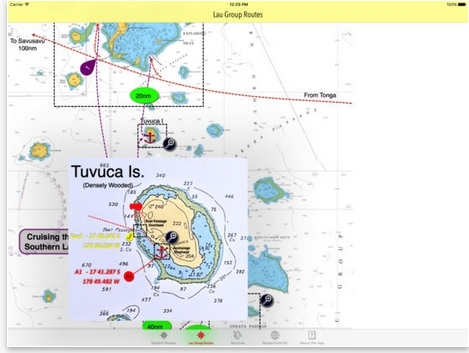 By publishing in App format the guide can be constantly updated whenever John and Lyn revisit an area or cruisers advise updated information. The guides offer a ‘big picture’ view with cruising routes and Port of Entry information. From there it’s simply a matter of drilling down into the area you intend to cruise, with charts getting more specific with waypoints and suggested routes. It’s easy to navigate around the guide, which is laid out in a logical format. Helpful tips and photographs show passages likely to be challenging or navigational hazards to be wary of. Overall, it feels like the information provided is accurate and well considered and notes and recommendations can be trusted.